﻿ Best Price on L'escale Tropicale in Sainte Anne + Reviews! 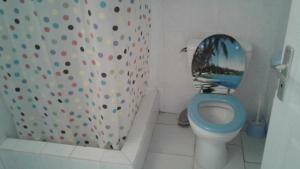 Located in Sainte-Anne, L'escale Tropicale has free WiFi. The property has barbecue facilities, as well as a garden. The guesthouse has a terrace and a hot tub. All rooms are equipped with an oven, microwave, a coffee machine, a shower, a hair dryer and a desk. Rooms include a flat-screen TV, and some rooms contain a balcony. At the guesthouse each room comes with a seating area. The area is popular for snorkeling and cycling, and car rental is available at L'escale Tropicale. Le Gosier is 10 miles from the accommodation, while Saint-François is 9 miles away. Pointe-à-Pitre Le Raizet Airport is 14 miles from the property.